This blog post discusses Xamarin's current plans to support the 32 and 64 bit frameworks in our products. When we first created the C# bridge to iOS with MonoTouch, we mapped the data types from Objective-C to their equivalent data types in C#. Since C# does not have an equivalent to "typedef" we also mapped type definitions into their underlying data types. This means that we mapped C types like int to System.Int32 (short: int) float to System.Single (short: float). This is because on .NET the int data type is defined to be a 32 bit integer, and long is always a 64 bit integer. We also chose to map things like CGRect to RectangleF at this point. But most importantly, we mapped things like NSInteger as int and CGFloat to float, since NSInteger was a 32 bit value and CGFloat was a 32 bit value. We later did the same work for the Mac and we continued doing these mappings. We were living in a 32-bit world. The 64 bit version of OSX had defined NSInteger and CGFloat to be 64 bit values, changing the assumptions that we had made. // oops, can not cast a long into an int. When we combined source code breakage with the fact that Apple had a 32-bit compatibility story and we had some legacy libraries that depended on 32-bit only APIs meant that we were in no rush to move to a 64-bit world. With Mountain Lion, Apple started to ship a handful of their new frameworks only as 64-bit frameworks. This means that for the first time, MonoMac was not able to provide bindings to some frameworks. At this point, we realized that we had to get out of our 32-bit comfort zone. But we still needed to support 32-bits, since iOS was a 32-bit only API and OSX was turning into a 64-bit only API. We needed some way of sharing code. Audit all of our APIs and annotate every use of NSInteger and provide tooling to ensure that we had both 32 and 64 bit APIs. This would allow us to produce both 32 and 64 bit bindings. Build a tool to help Mac users migrate their applications and upgrade their uses of the narrower data types to the wider ones. Our thinking was simple: every new Mac would be 64-bit capable. So this means that we could support the old 32 bit API for existing Mac users, but new APIs would require the source code to be upgraded to 64-bits, never to look back again. There was little incentive to expand support for 32-bit only APis on the Mac. The world was going 64. We were executing on this process when Apple introduced the iPhone5s with a 64 bit processor. The iPhone5s forced us to revisit our assumptions. Apple introduced the 64-bit iPhone5s, but also introduced the iPhone5c which is a 32-bit processor. This means that developers need to be able to target 32 bits for at least some five years. We had two choices with the old strategy with regards to iOS: either stay in the 32 bit world for the next five years or force users to maintain two codebases (one for 32 and one for 64). Neither option was attractive. So we resorted to a more sophisticated approach that we had originally dismissed. Our goals shifted. While we could ask Mac users to do a one-time switch, we could not ask that from our iOS users. We needed to support both 32 and 64 bit code from a single codebase, even if this required some magic beyond bindings. Compiler, linker and tooling would have to come together. We are now going to keep our existing 32 bit APIs --for the sake of backwards compatibility for all of our iOS and Mac users-- and also introduce new APIs that are 32/64 bit ready. We are doing this by introducing a few new data types: nint, nuint and nfloat which are 32-bit wide on 32 bit architectures, and 64-bit wide on 64-bit architectures. We would also move from RectangleF, SizeF and PointF to CGRect, CGSize and CGPoint which would be defined not in terms of the C# float data type, but in terms of nfloat. These data types will live in the System namespace inside the Xamarin.iOS.dll and Xamarin.Mac.dll. By defining these are plain structs, we ensure that any code using these data types is legal C#, compatible with Microsoft's C#. But at runtime, depending on which platform you are running, you will get either 32 or 64 values. This means that all of the Objective-C APIs using NSInteger that we originally had mapped to int will now take an nint but also that users can choose to stay on a 32-bit world, or have code that automatically compiles to both 32 and 64 bit at the same time. In the above case, count will be a 32 bit value on 32 bit systems and 64 on 64 bit systems. This means that you can always go from an nint to a C# long. But going from a nint to an int requires a cast as there would be data loss in the case where the nint is a 64 bit value. Will compile down to drastically different IL. We have taught our VM to understand these new data types and treat them in the same way that we would treat a native type. This means that there is no performance difference between the use of int vs nint. The call op_Addition ends up being the same as the native ECMA CIL add instructions. The IL might look scarier, but the native code is identical. We chose the names nint, nuint over the built-in IntPtr and UIntPtr, because they felt natural "native integers" as opposed to the cultural association that IntPtr has with pointer or a native token. Additionally, we did not have the equivalent native floating point type. We chose to stay away from using the names NSInteger and CGFloat for a couple of reasons: the functionality is general enough that it might be worth using in Mono in places beyond Mac and iOS and because it feels like these are real VM supported types as opposed to some type definition or alias. In an ideal world, these would eventually be part of the C# standard. What will the world look like? Users that are happy living in the pure 32 bit world will get to keep using their existing assemblies and project types (monotouch.dll and MonoMac.dll/XamMac.dll). 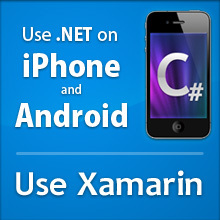 Users that want to adopt new 64-bit only APIs, or want to have their code automatically run on 32 or 64 depending on the target CPU will use the new Xamarin.iOS.dll and Xamarin.Mac.dll assemblies and a new project type that knows how to build dual 32/64 binaries transparently. One added benefit of this new design is that third party components and libraries will automatically be 32/64 bit ready. We will also distribute the same tools that we used to upgrade from 32 to 32/64 to assist our users that want to migrate existing codebases to the new 32/64 bit world.